With far more features than most will ever need, WaveLab retains the audio editing crown, though it could do with tidying up. Unrivalled feature-set. Flexible loudness metering. Useful new plugins. Visual improvement on v7. Tabbed plugin windows. Steep learning curve. Icon-heavy interface still feels messy. The last full version update to Steinberg's much-loved audio editor/mastering environment WaveLab added Mac OS X support, an improved workspace and new mastering plugins from Sonnox. It was hard to fault from a bells-and-whistles perspective, standing as by far the most feature-packed editor of its kind. However, in our Wavelab 7 review, we did feel it lacked some of the visual finesse we've come to expect from market-leading applications. "There are the inevitable operational tweaks and workflow improvements, although the fundamental package remains the same"
Fast-forward almost three years, and we're happy to report that WaveLab 8 boasts slightly improved graphics! Also new are user- configurable loudness metering and processing, iZotope MBIT+ dither, the Master Transport Panel, tabbed plugin windows and Speaker Configurations (see Speaker management). You also get three new plugins: Voxengo's CurveEQ, and Steinberg's Tube Compressor and Brickwall Limiter, taking the overall plugin count to a very respectable 35. There are the inevitable operational tweaks and workflow improvements, although the fundamental package remains the same, offering individual file editing and multiple file sequencing, as well as CD mastering (the so-called Audio Montage), batch processing and podcast preparation. There's support for audio files up to 384kHz/64-bit float, and as you would expect, Steinberg's CI, CMC and CC121 controllers and interfaces are ably supported. And for those who don't need the complete feature-set, there's a slimmed down version available, too - WaveLab 8 Element - at a commensurately slimmed-down price (£82). Loudness metering can be a very helpful tool indeed when matching up varied material. WaveLab 8 offers several new features in this area, including a loudness display with a level-against-time graph trace providing information on momentary, short-term and integrated loudness, as well as True Peak and loudness range. "The Loudness Meta Normalizer matches the loudness of audio clips within an Audio Montage"
This is complemented by your more typical loudness meters, indicating momentary, short-term and integrated loudness (levels only), along with a handy histogram. The meters are highly configurable, with both EBU and custom scaling, and overall standardised presets (Classical R-128, for example). You can also customise the ranges and colours. The most interesting new loudness-related feature is the Loudness Meta Normalizer. This aims to match the loudness of audio clips within an Audio Montage, either to the loudest clip or to a specific value. It's a good idea that we found worked pretty well. Of the three new plugins, Brickwall Limiter is the most basic; however, both Tube Compressor and CurveEQ are excellent. Particularly notable are the compressor's three sidechain options (low-pass, high-pass and band-pass, with adjustable cutoff and Q width), tube drive and mix balance control. CurveEQ is a Voxengo classic (also bundled with Cubase 7): a 64-band spline design that's about as flexible and easy to use as EQ plugins get. On the subject of plugins, effects chains are now presented in a tabbed window, enabling you to add, remove and switch processors around all within the one panel. It's worth noting that this is available to the various Montage effects sections (clip, track and master), but not the overall Master Output section. WaveLab 8 remains largely unchanged from WaveLab 7 in terms of workflow and functionality. However, there are some new operational changes that are worth mentioning. First, the new Master Transport Panel, which sits either above or below the waveform display. "The new Master Transport Panel brings together many useful controls, including range selection and anchor points"
It's window-specific (and so has far more buttons in the Montage window than in the Batch processor) and brings together many useful controls, including range selection and anchor points, as well as more obvious functions such as play and record. Some of the buttons also use drop-down menus for further functions and customisation, and once you have a setup you like, you can save the whole thing as a preset. If you'd rather not use the Master Transport Panel at all, you can fold it away. 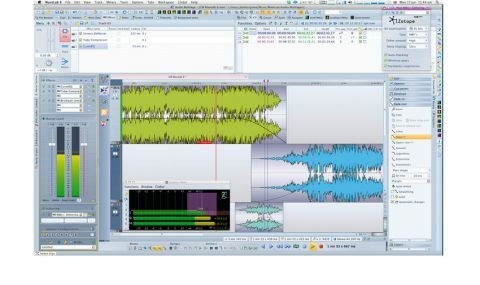 Beyond that, there are also some useful additions to the editing tools, including 'Raise selection with envelope' (raise or lower the volume envelope of the selected audio section only) and 'Create clip from selection', both of which are the sort of operations you'd normally expect to find in a DAW rather than an audio editor. Finally, the new 'Super Clip' option simplifies an Audio Montage by rendering multiple clips into one, while still retaining the original layout as a sub-montage should you wish to go back to it later - sort of a cross between bounce and freeze. WaveLab is a powerful, complex application, but the wealth of features on board means that whether you're editing just a single audio file or collating multiple Audio Montages within a Master Project, you always have access to a truly excellent set of tools. Version 8 improves these tools and makes some nice visual and operational tweaks to what came before. However, newcomers will still find themselves negotiating a moderately steep learning curve that isn't helped by the icon- heavy GUI. Indeed, even experienced users will probably find the context-sensitive tooltip help system handy at times. It's also quite pricey, and in a world that's rapidly shifting away from the CD format, some of its functionality is less vital today than it used to be.